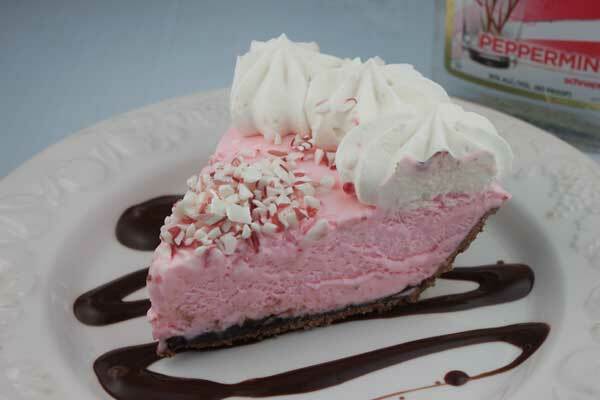 Frozen peppermint pie made with marshmallows, whipped cream and Peppermint Schnapps. Brush pie shell with egg white and bake at 375 for 5 minutes. Let cool completely. In a large, microwave-safe mixing bowl, combine marshmallows, sugar and butter and microwave for 30 seconds on high. Stir well until mixture is melted and smooth. Stir the Schnapps and vanilla into the marshmallow mixture, then stir in a few drops of red food coloring or paste until dark pink. Let cool completely. Fold 1 cup of the whipped cream into the marsmallow mixture. Put the mixing bowl and the remaining whipped cream in the refrigerator for 30 minutes before proceeding -- this helps thicken it a bit. Fold the remaining whipped cream into the peppermint mixture. Pour this mixture into the fudge lined pie shell -- the filling should be thick enough so that it doesn't ooze all over the place, but it won't be as thick as whipping cream. Freeze the pie for at least four hours. After four hours, pipe some sweetened whipped cream around the edges and freeze until ready to serve. Sprinkle peppermint pieces in the center. Serve with chocolate syrup if desired. I took a shortcut and used a storebought chocolate crust. For a homemade crust, grind 24 Oreos in a food processor and mix with 4 tablespoons softened butter. Press into a inch pie dish and chill until firm.No need to bake. For sweetened whipped cream, beat 6 ounces of whipping cream with 2-3 tablespoons of powdered sugar. Beat in 1/2 teaspoon of vanilla.